Living as We: Baby Bullet Giveaway! hosted by The Parenting Patch and sponsored by Baby Bullet. For more information about the Baby Bullet Complete Baby Care System, check out my Baby Bullet Review. One lucky reader of The Parenting Patch and Living As We will win one (1) Baby Bullet Complete Baby Care System valued at $59.97. After reading through The Parenting Patch's review, I think this is something every mom could use! I look forward to trying it out for my next little one. Have you ever used the Baby Bullet? Good luck! To enter for your chance to win the Baby Bullet Giveaway, simply use the following Rafflecopter form. Happy cooking! The Baby Bullet Giveaway is restricted to legal residents of the United States of America and Canada. 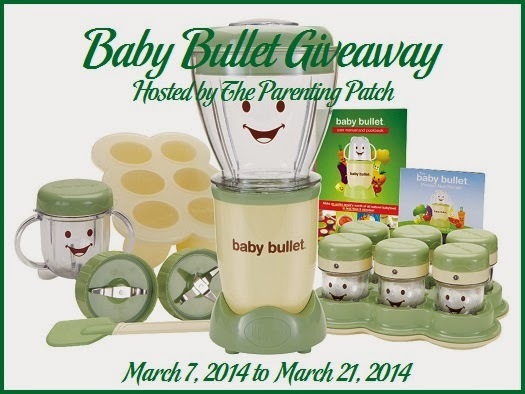 The Baby Bullet Giveaway ends at midnight CST on March 21, 2014. One winner will be chosen at random via Rafflecopter. The winner will be sent an email and will have forty-eight hours to respond. If no response is received within forty-eight hours, another winner will be chosen. The Parenting Patch and Living As We not responsible for prize fulfillment.